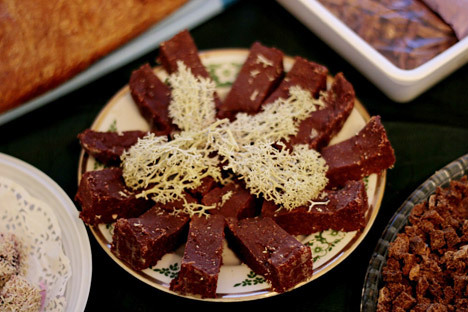 Anyone for tundra bread and reindeer moss chocolate? Scientists in the Russian Arctic have developed a new ‘fast food’ made from sphagnum and reindeer moss. Researchers claim that the food has special restorative properties and offers a healthy alternative to soy-based products. Scientists from the Arctic Studies Center have developed the Arctic region's first fast food from moss and lichen, specifically sphagnum and reindeer moss. Researchers from the northern peninsula of Yamal, in Western Siberia, insist that the food can help to restore strength and energy after long periods of physical exertion. Unlike ordinary fast food, it does not contain harmful additives, preserving agents, GM components or soy. It even helps to address demographic issues. The new northern fast food consists of a packet of croutons made of yeast-free batter based on sphagnum (peat moss) and a packet of sauce made from reindeer moss. Mix the two, add boiling water and three minutes later you have a ready meal, which is not only very filling but also has medicinal properties. Reindeer moss is a natural antibiotic which is used even in treating tuberculosis, while peat moss can be used to treat bronchial asthma and many other conditions. Initially, it was planned that Arctic fast food could help address the problem of food supply on the peninsula. Yamal, whose name could be translated as "the end of the earth", is known for its severe Arctic climate. Peat and reindeer moss grow in Canada, Finland, Sweden, Norway and Alaska. In Russia, the most promising areas for collecting sphagnum are Yamal, the Khanty-Mansi Autonomous Area, and the territory between the Tomsk, northern Omsk and Sverdlovsk regions. It is populated by the indigenous peoples of the north: Mansi, Nentsy, Khanty, and the Selkup. In recent years, they have been consuming a lot of commercially-produced foodstuffs and, as a result, developing various allergies and gastrointestinal conditions. "Why did we decide to create healthy foodstuffs based on sphagnum? Primarily, we were of course interested in its medicinal properties. Moving down the intestines, sphagnum, like a sponge, absorbs toxins and allergens and removes them from the body," explains the deputy head of the Arctic Studies Center Andrei Lobanov, PhD in Medicine. The scientists admit that while they were developing food from reindeer moss and sphagnum, they could not imagine that their findings would be of interest to anybody outside Yamal. But it turned out that same problems are experienced by residents of all big cities, be it in India or China. Andrei Lobanov points out that the consumption of unhealthy fast food has another undesirable side-effect: It affects the birth rate. “These days, most fast-food components, be it meat, bread, pastry, etc., use soy. In the past, Japanese women used to give their men soy in order to reduce their sexual appetite,” explains Lobanov. Lobanov laments that a whole generation of people has already grown up on this food, and worries that the human ability to procreate will be threatened unless the trend is broken. “We increasingly more often see a new type of men, with breasts, bloated features, and eyes devoid of any sparkle; and women suffering from a disrupted menstrual cycle, a volatile emotional state, with a deformed figure, swollen deltoid muscles and broad shoulders. The issue of finding a substitute for soy is unavoidable. And we have made one such universal filler from sphagnum,” says Lobanov. The list of innovative foodstuffs developed by the Yamal research center includes not only fast food but also candies, jelly made of northern berries and moss, reindeer moss chocolate, tundra bread (60 percent consisting of peat moss), as well as a drink made of black crowberry, birch bark and alcohol distilled from sphagnum. Black crowberry is a stimulant that does not increase blood pressure but makes it easier to restore energy after physical exertion. Scientists believe that these foodstuffs could be used not only by inhabitants of the tundra but would also be good for office employees to minimize the ill-effects of a sedentary lifestyle and stress. Can Arctic eco-products generate a profit? It is believed they can. They are likely to be cheaper to make than traditional foodstuffs. As for their market price, it is too early to say, since the market has not been studied yet: No such products exist anywhere in the world. At the same time, the Arctic Studies Center has already been inundated by requests to share the technology for their production, including from abroad. Interestingly, most of the inquiries about how to turn moss into food come from Indochina. The Yamal scientists are planning to launch a small test production by the end of 2014. The developers of the Arctic eco-products want the key element of the technology – the substratum of the moss – to be produced only in Yamal, while the final products – bread, jelly or candies – can be made anywhere, including China, as long as there is demand for them.